According to the Encarta Dictionary, a toxin is: a substance that accumulates in the body and causes it harm. I would venture to say that most people know that we encounter “toxins” on a daily basis. What you may not know is how frequently we encounter certain toxins and what effects they can have on your children. Not long after our son, Ethan, was diagnosed with Asperger’s Syndrome in 2006, an Autism Spectrum Disorder (ASD,) I started searching for tangible ways I could help him. As I delved into the research, I learned about biomedical treatments. Thanks to Jenny McCarthy and lots of very dedicated and brilliant medical doctors with Autistic children themselves, biomedical treatments have become more popular and better understood in the past few years. With the help of Dr. Seshagiri Rao, a wonderful local DAN! doctor (Defeat Autism Now!) we ran lab tests a couple years ago to determine how Ethan’s various systems were working. Astonishingly, we discovered that he had a terrible yeast-overgrowth in his intestines, was extremely deficient in some Neurotransmitters with an over-abundance of others, and was showing very high heavy-metal readings of Mercury, Lead and Arsenic. We also found that his zinc-to-copper ratio was extremely out of whack and uncovered a number of other deficiencies which needed to be treated. Over the past two years, we have also unearthed a bacterial overgrowth, an Amino Acid deficiency and discovered that Ethan’s body does not produce enough Glutathione, a key antioxidant. Even though he appeared to be a “healthy” child, Ethan was ill on so many levels, and the illness was manifesting itself through his behaviors! Here we were a typical middle-class American family with a healthy diet and access to standard American medical care via a PPO. How could our sweet boy be so very sick? I began to compulsively research how this could be. Further, I explored all available options for helping Ethan’s little system heal. Much of what I have learned along the way is knock-your-socks-off-scary. I’ve come to the disturbing conclusion that we now live in an extremely toxic world. I think every parent needs to be aware of certain toxins which may be damaging an entire generation of children. Families, especially those with susceptible children (think ASDs, Asthma, Allergies, ADHD, etc.) need to consider putting safeguards into place. Sadly, these kids’ systems are inefficient and often unable to process out the nasty toxins. Lead: Though it was banned from paint and phased out of automobile fuel in the 70’s, lead is still a concern for modern families. Airplane fuel consumption, metal melting, auto body finishing, cement manufacture and incineration all routinely release lead into our atmosphere. (Note: we lived just south of the DFW airport while I was pregnant with Ethan and until he was about 3 ½ years old.) Also, we must not discount the numerous reports of imported toys testing ridiculously high in lead levels in recent years. Arsenic: Added to chicken feed to kill parasites and promote growth, Arsenic accumulates in the chickens (which we eat) and is passed into their excrement (which is later used as fertilizers on other farms) so it is then passed back into the aquifers. Conversely, not only are we getting it in our chicken meat, we are also drinking it in our water and ingesting it via contaminated crops (like rice) grown/farmed in our contaminated water supply. That’ll make you think a little longer about your next “Chicken and Rice” dinner! Knowing all of this, I now “invest” in organic, free-range chicken meat. Mercury: a.k.a. Hg, Mercury is considered the most toxic, non-radioactive element on the planet and is a verified neurotoxin. Yet, our country alone releases an estimated 200 metric tons of mercury into the environment each year. Once released into the atmosphere, it returns to earth as rain and pollutes every body of water. For me, Mercury raises concerns on several levels: 1) Fish consumption, 2) Dental Amalgam Fillings, 3) Flu Vaccines. While a “safe” level of mercury has never been truly identified, the US EPA recommends no more than 0.1 mcg/Kg of body weight per day. • Most fish have 0.2-0.3 mcg of Mercury per gram of meat. You do the math–one 6oz serving of fish could easily calculate to total several days’ worth of “recommended 0.1 mcg/Kg” mercury in one sitting, for an adult; the assault to the system of a child would be even greater. • Secondly, Dental Amalgams (which I had while pregnant with Ethan,) release mercury each day as a result of chewing. (Yes, that’s right…chewing!) Say a person has 8 amalgam fillings, an estimated release of about 104 mcg of mercury vapor each day would flood their system, which is well over the “recommended” EPA daily exposure. Just a couple more surprising sources of Hg to consider: light-up shoes and shirts, plus there are even small amounts of Mercury in most high-fructose corn syrups. Ethan had to part with some really cool Sketchers this month because we just can’t chance exposing his body to more Mercury if one of the light mechanisms gets broken. Phthalates: Used to soften plastic and make it more flexible, Phthalates are found in such things as soft plastic water bottles, soft vinyl toys, shampoos, hair sprays, perfumes, deodorants and various pharmaceuticals. Phthalates are known hormone disrupters which cause sperm and genital problems in males. Next time you buy a water bottle on-the-go, consider that it has released phthalates into your water, especially if it has experienced any heat on the way to your hands. Invest in reusable stainless steel water bottles and glass storage containers for your left-over food to protect your family and help the environment, too. Flame Retardants: a.k.a. PBDEs (polybrominated diphenyl ethers) are known to disrupt thyroid function, cross the placental barrier and pass through into breast milk. 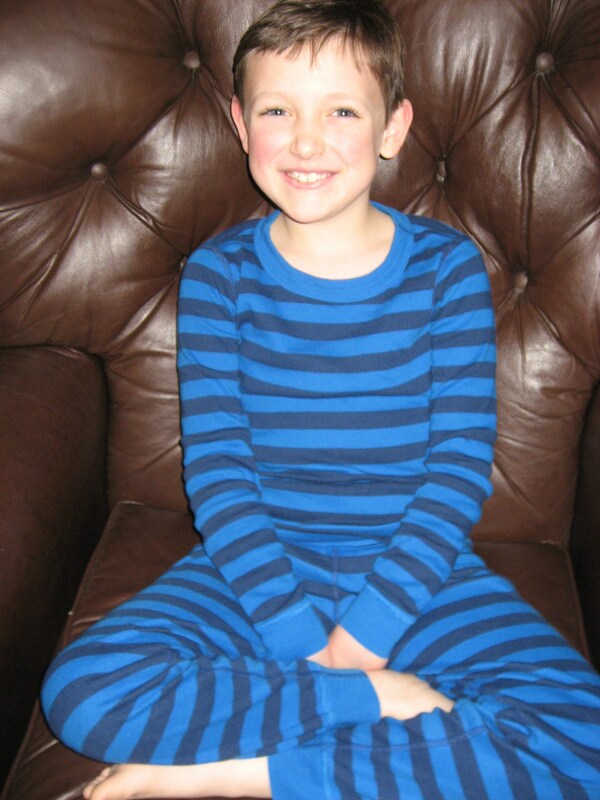 Flame retardants are commonly found in children’s pajamas, in furniture foam, in carpet padding and are even found in cell phones, computers and TV monitors. Our children are often sleeping on mattresses with PBDEs and wearing PJs with PBDEs…so they’re breathing the fumes for 9+ hours every night! Then, they spend many waking hours in classrooms and/or homes with computers, TVs and cell phones. Additionally, PBDEs are being found in our water supply and getting passed along to farm-raised fish. We now only buy organic cotton PJ’s for Ethan and when it is time to replace bedding we’ll purchase an all-natural organic cotton mattress. Though these options are much more expensive than their PBDE counterparts, we think they’re worth it. 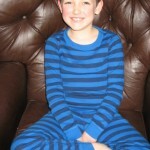 No flame retardants in these jammies! Bisphenol A: a.k.a. BPA, found in hard plastics including many baby bottles, the lining of tin cans, food containers and many dental sealants. BPA is associated with breast and testicle cancer, diabetes, hyperactivity, obesity and low sperm. Be aware–since babies’ livers are so new, it is estimated that 3-6 month old babies are likely to accumulate 5x more BPA than adults, from comparable exposure. The Obama administration has recently gone public with questions regarding the safety of using BPA. Additionally, some companies have shown concern in recent years and now create BPA-free products, like BornFree Baby Bottles. Sure wish I’d known when Ethan was a baby how very damaging BPA can be. Teflon: a.k.a. PFOA (perfluorooctanoic acid,) is used to prevent food from sticking to cooking surfaces. This chemical is actually classified by the EPA as a “likely carcinogen.” How many of you are preparing your meals with an invisible side of a “likely carcinogen?” We recently got rid of all of our non-stick cookware. Non-PFOA cooking options to consider for your kitchen: stainless steel, cast iron, ceramic titanium, and porcelain enameled iron. Polyvinyl Chloride: a.k.a. PVC, often used in flooring in American houses. A study in NeuroToxicology in Feb. ’09, found a direct relationship between PVC flooring in a mother’s bedroom during pregnancy and the future development of an ASD. A simple word to the wise: consider alternative flooring in your master bedroom and the kids’ rooms, if possible. Hardwood and tile floors are increasingly more popular with families concerned about toxins in the home. Styrofoam: A polymer of styrene, Styrofoam is made from benzene, which is a known carcinogen. Styrene mimics estrogen and disrupts hormone function. Absorption of styrene is increased by higher fat content of food, by alcohol, by lemon juice and by the heat of the contents. (Think about your morning Latte. Did it come in a Styrofoam cup, at a high heat, with cream in it?) Not to say that you should never again treat yourself to a steaming hot cup of coffee or tea, but it would be wise to carefully monitor your exposure. Also, ground meat is usually placed on a Styrofoam tray and wrapped with Phthalate-ridden plastic. Tote reusable coffee cups with you and ask your butcher to wrap your meat in butcher paper. Pesticides: Dursban (chlorpyifos) is one of the most widely used insecticides and is one of many nerve gas derivatives commonly in use in our society today. While the EPA declared that it “posed unacceptable health risks” in 2000, it was never banned. Some companies have withdrawn it from residential sales but it is still widely used in schools, daycare centers, hospitals and crop fields. As such, food is now identified as a major source of exposure to pesticides in young children. This is why we buy locally grown organic foods whenever possible. “Organic” simply means that the food was not processed with synthetic pesticides or fertilizers, sewage sludge, genetic engineering or irradiation. Non-organic foods are processed with thousands of chemicals, many of which have never been adequately tested for toxic effects, especially in varying combinations with one another. We have a local company come in quarterly to help us handle our “pests” in an all-natural fashion so I don’t have to fret about allowing Ethan to play in our backyard. PERC: a.k.a. Perchloroethylene or Tetrachloroethylene, is used in the dry cleaning industry. Over exposure to PERC can cause impaired memory, confusion, drowsiness, vertigo, irritability, loss of appetite, nausea and vomiting; continued exposure can cause tremors, numbness, coma and death due to respiratory paralysis. If you must dry clean your clothing, look for companies using CO2 based or silicone based techniques instead of PERC. When you do bring your dry-cleaned garments home, remember to leave them covered (in your car). Then hang them outside, take the plastic off and allow them to air out for a couple of hours before bringing them inside. VOCs: a.k.a. Volatile Organic Compounds. VOCs are often used in paints and solvents. By definition, “volatile” simply indicates that these chemicals readily evaporate into the air. In this way they pollute our environment and when trapped within the confines of a house or building, can irritate and harm the people who breathe in the fumes. Non-VOC paints are more natural, often created from other organic compounds. As such, they not only smell better but they are far less likely to worsen pre-existing conditions like allergies or chronic respiratory problems. Our last home project required several coats of paint and we went with a Non-VOC option and have been quite pleased. While this is by no means a comprehensive list of toxins American families are raising concerns about, and I am far from being a medical doctor or an environmental expert, I felt this information was too useful and important not to share. Much of the information shared above I learned at a DAN! Conference hosted by the Autism Research Institute in Dallas in October ’09. Dr. Stuart H. Freedenfeld, Medical Director of the Stockton Family Practice and Autism Treatment Center in Stockton, New Jersey, gave a very informative talk called “Defending Your Child from a Toxic World” to a room full of stunned parents, doctors and caregivers. Though I very nearly left Dr. Freedenfeld’s presentation that night feeling completely overwhelmed and panicked due to this over abundance of truly nightmarish information, I took something Dr. Feedenfeld said to heart and would suggest you to do the same. To paraphrase, the doctor encouraged everyone to take things slowly and make changes at a pace with which you’re comfortable. Don’t beat yourself up for things you’ve done in the past which “may have” contributed to a health problem. If you think there might be a problem now, err on the side of caution and make the changes you can to create a safe, healthy environment for your family. Thank you, Dr. Freedenfeld, for teaching me how to “defend” my family and encouraging those of us in your presentation to pass the knowledge along. If you know of other toxins that you feel are a true concern to American families, please leave a comment below because this is by no means an all-inclusive list. Let’s use this as a tool to inform one another. I hope you can use my notes to “clean up” your family’s environment as much as you see fit and I look forward to learning from you. For us, “project clean up” is a true work in progress and happens in gradual steps. While we still haven’t altered everything I’d like, I’m proud of the changes we have made and feel confident that each change has helped my son become healthier and stronger. Last year at this time, I had just started writing for the Dallas Moms Blog and was excited by some social progress Ethan was making with his peers at school (thanks to two very busy Italian plumbers). As I refect on Ethan’s progress (and work on a new post about Ethan’s progress regarding social awareness this year for AutismSpot.com to be posted tomorrow) I wanted to re-share this post from February 10th last year! With Valentine’s Day this Sunday, relationship-talk is abundant. Everyone seems to have something important to share about creating lasting relationships–and I’m all ears. Since my son (Ethan, 7 years old) lives with Asperger’s Syndrome (AS), an Autism Spectrum Disorder, he often has difficulty with forming and maintaining friendships. The truth is most kids and adults with AS have deficits related to social skills and communication. In our house, we are almost continuously immersed in friendship discussions in one form or another to help Ethan acquire skills which develop organically in the majority of his peers. Don’t get me wrong, my guy is one heck of a talker, he’s highly verbal and loves a good chat. His “communication deficits” have more to do with understanding non-spoken elements of communication like body language, facial expressions and utilizing fundamental pragmatics of language. He tends to have difficulty realizing when friends are tired of hearing him talk about certain topics or when a friend wants him to stop doing something bothersome or irritating. We work to understand and embrace these difficulties in our house and try to find inventive ways to role play or use daily situations as conversational springboards to help Ethan learn more about successfully communicating with those around him. Thankfully, Ethan also attends a phenomenal Social Thinking Group (based on the Social Thinking Curriculum developed by Michelle Garcia Winner) with other kids and several very dedicated therapists at Help, Hope, Solutions in Plano. In this way, Ethan is constantly learning new social thinking skills at home, in therapy and at school. It is the school part that is hard on all of us, simply because my husband and I can’t control anything that happens or help Ethan problem solve on the playground, in the lunch room or during any of the other social times built into the school day. Imagine my delight when I recently discovered that by giving Ethan his own hand-held Nintendo DS game player for Christmas, we have actually facilitated conversations with “neurotypical” peers at school (appropriate conversations at that!) Over the past month, since Ethan received the Super Mario Bros. game as a gift from his Aunt and Uncle, he has been forming bonds with friends at school and creating opportunities to interact with new kids at lunch and during recess. He has shared with us that two classmates share his love for the 25+ year-old-video game. I personally witnessed him utilizing the characters, the game levels and winning strategies with one of the boys when I dropped in at lunchtime while I was volunteering for the school’s Scholastic Book Fair. 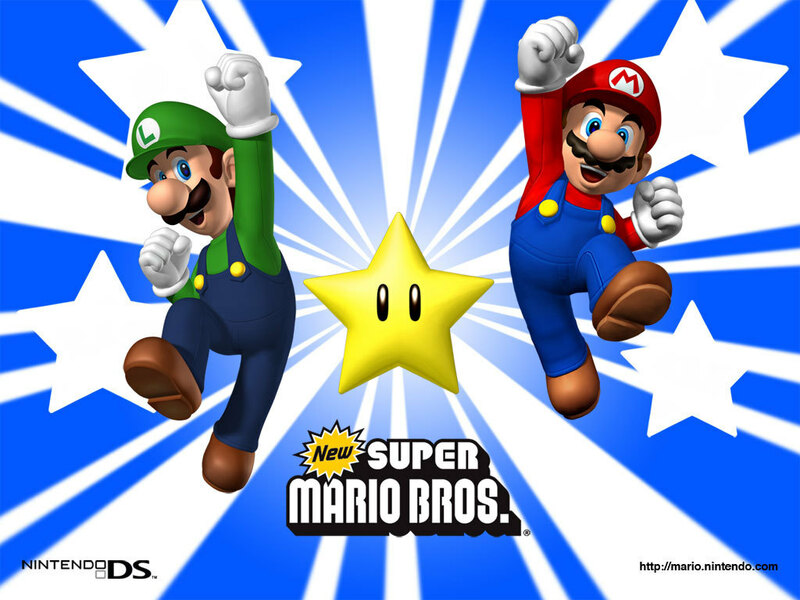 Who would have ever guessed that I would love two miniature, super-human, Italian-American plumbers so much? 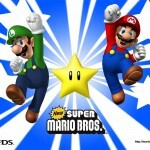 This Valentine’s Day, I unashamedly admit–I ♥ Mario and Luigi! Do you have any unexpected loves you would like to share this week leading up to Valentine’s Day? Have you ever stumbled across something unexpected but ever-so-appreciated nonetheless? I’d love to hear about your startling discoveries and surprising loves. Update: As of 2011, Ethan still loves playing Super Mario Bros. and has actually begun playing on a Nintendo Wii purchased with his birthday money last fall. For a post about our decision To Wii or Not To Wii, please click through to see my post for AutismSpot written last November!